Join Kathy Cooper for a morning led Ashtanga practice followed by lunch and two afternoon workshops exploring the intricacies of the Ashtanga Vinyasa Yoga system. This is an invitation to deepen your Ashtanga yoga practice for a delightful journey into your Self. Kathy will use her 41 years of study and practice of Ashtanga, Iyengar and Anusara Yoga to support you to reap the benefits of this royal path of yoga. 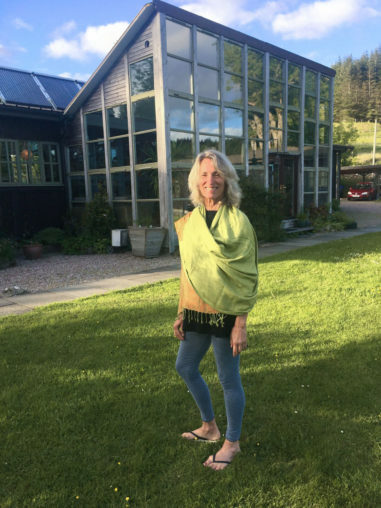 After Kathy’s day workshops last year we are delighted that she has to come back to Cornwall for another day workshop and extended weekend retreat. She is known as a ‘teachers teacher’ because she is one of a handful of people in the world who has completed all six of the Ashtanga series. You will receive instruction tailored to your body to release any blocked energy and access your vitality. Focusing on the breath, bandhas and alignment, Kathy will fine-tune your practice to allow you to access the deeper layers of the body/mind. This practice holds the keys to the fountain of youth so take this opportunity to learn from a yoga practitioner who is the living embodiment of the benefits of a lifetime yoga practice. Kathy has been practicing Ashtanga Yoga consistently since 1976. David Williams and Nancy Gilgoff were her primary teachers. They taught her all of the Ashtanga series and pranayama. She also studied with Guruji (K Pattabhi Jois) on many of his extended trips to the US, and in Mysore, India. She longed for the deeper truth of life which led her to explore Sufism, Shamanism, Vipassana meditation, and awake teachers. Daily practice has supported her journey impeccably, both in integrating openings and in surrendering to the now. Kathy practices jin shin jyutsu, a type of accupressure which is deeply harmonizing which is a perfect accompaniment to yoga. She brings this informed, deep, long-time practice to her teaching, supporting practitioners to strengthen their core/breath/alignment to avoid injuries and move from the inside out. Suitable for people with an established yoga practice. * Do let us know if you have any dietary requirements, we cater for everything. Kathy is filled with a balanced light of both broad loving energy that feeds the soul and that burning single-pointed ekagrata shiva energy that is capable of building cities(and tearing them down). She expresses a lifetime of accumulated wisdom that facilitates her open fearlessness. She exemplifies living our yoga. After 15 plus years of practicing Ashtanga yoga, I am consistently able to receive and integrate Kathy’s teaching the best. Her recent instruction gave me immediate results in opening my hips. I was able to sit comfortably in lotus during a Zen sit. It was unprecedented! Kathy Cooper is my favorite yoga teacher! Her attention to the unique character of my body while always emphasizing the strength and focus of core breath enables me to stay motivated, as I find new openings and freedom. What an amazing teacher! Kathy is one of the few “old” students of Pattabhi Jois who continues to practice daily for over three decades. Her grace, compassion and knowledge continue to inspire students of all ages and levels. Kathy is very qualified to teach Ashtanga Yoga. Through years of practice, Kathy has shown her love and understanding of the Ashtanga method taught by Sri K. Pattabhi Jois. She is excellent at taking beginning students safely into the practice, as well as teaching the more advanced practitioners. I have no hesitation in recommending her. Kathy Cooper has been practicing and teaching Ashtanga yoga for thirty some years. She has completed all the postures in the K. P. Jois tradition and would be considered a PHD in this field. If you are a sincere and devoted student, you would be lucky to study with her. I’ve known Kathy Cooper for approximately 32 years. She is one of a handful of Ashtanga Yoga practioners who has learned the Advanced A and B sequences. She has maintained a consistent practice as well. Kathy is also a gifted yoga teacher who is gentle, compassionate, observant, thorough and kind in her approach to teaching. I have often recommended her to individuals and groups that I have taught Yoga to. Everyone who I have recommended Kathy to as a teacher has been very thankful to meet and work with her. I have been teaching Ashtanga Yoga for 35 years. In that time, I have taught less than a dozen people the entire four series. One of these people was Kathy Cooper. She began practicing with me in 1976. Kathy is a true yogini. Her practice and her personality are beautiful and an inspiration to everyone who meets her. She is as nice a person as you will ever meet. Whenever I am asked to recommend a yoga teacher in the San Francisco area, without hesitation, I always recommend Kathy first. She is the best.